At the start of the week, I looked at my training program and saw I had a 10 mile run for the upcoming Saturday. I thought it would be more fun to do that training run in an actual race, so I started searching for one. I was lucky and found a 10K in Lawrence called the Nash Dash. I hadn't done this race before, but I thought it sounded fun! The course started downtown on Mass St, and went up on the University of Kansas campus, so I knew there would be challenging hills! I decided to do 4 miles before the race and then do the 10K to get the other 6 miles in. I thought I might be crazy for doing it in that order, but I wanted to get it over with and not have to run after I had done the race. So I got there early, ran almost 4 miles, and then went to the start line! The great thing about this race was it didn't start until 8:30 and I'm not a morning person, so it worked perfect! The weather was pretty perfect that morning. Not too hot and not too cold and it was nice and sunny. First off I ran 3.83 miles in 38 minutes and 55 seconds. My pace was 10:09. I honestly didn't mean to go that fast, but I was feeling really good. Then I ran the Nash Dash 10K, which was actually 6.29 miles according to my Garmin in 1 hour, 3 minutes and 32 seconds which was a 10:06 pace. It wasn't a 10K PR for me, but it was pretty close! There were a few brutal hills, but that was expected when you're running on campus. The thing I didn't expect was for them to have us run up the steepest hill going up on campus. Challenging and hard and I was tired by the time I got to the top, but it felt good! A thing they did at this race that I'd never seen at a race before, was they did a hill challenge. On that steepest hill they had a time mat at the bottom and at the top, so they could get everyone's splits just on the hill. They gave prizes for the fastest hill sprinters. I wasn't one of the winners (or even close), so I can't tell you what they got. But I thought that was a unique thing for a race that added an extra competitive element. This is definitely a race I would do again because it's at a great time of year when the weather is really nice and it's always nice to do as many local races as possible! After hearing about the Rock-n-Roll series, I have always wanted to do one of the races. This was also the year for our 1 year Anniversary and we had talked about going on a mini vacation. 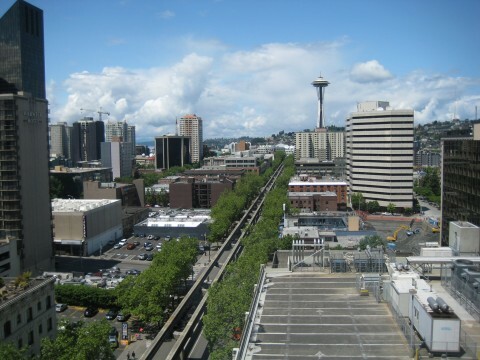 So, I started looking and we settled on Seattle for a few reasons. 1st and most important reason – my husband’s brother and his family live outside of Seattle and I had never met them and my husband hadn’t seen his brother for 10 years. They weren’t able to make it to our wedding, so we thought we would go to them. 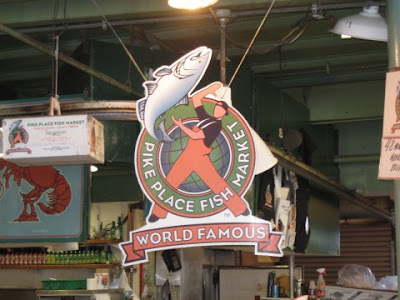 2nd reason – we could use this trip as our 1st Anniversary trip. 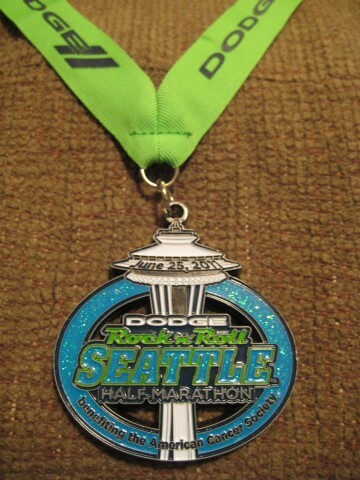 And 3rd reason – I could run the RNR Seattle half while we were there! So, we just celebrated our anniversary a little early (in June instead of August), I ran a race and we got to spend time with family. Very productive 5 day vacation! I’ll give the race report first and then post some pictures about the rest of our trip and all the fun things we did. The race was on Saturday, June 25th and I booked our stay in one of the hotels that sponsored the race. This was the best thing I could have done! All I had to do on race morning was get up, get ready and walk out of the lobby and get on the bus. The bus then shuttled us to the start in Tukwila which was about a 25 minute bus ride. I’m not a morning person, so not having to worry too much on how to get to the start was a huge plus for me! The morning was overcast and chilly, but not unbearable. 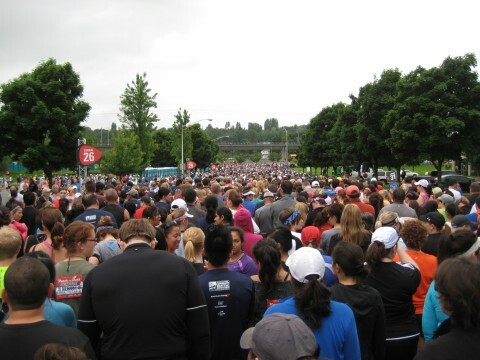 There were tons of people doing the race – I think around 35,000 – 40,000 people! I was toward the back of the pack and there was a lot of waiting. I actually crossed the starting line about an HOUR AFTER the actual start time. 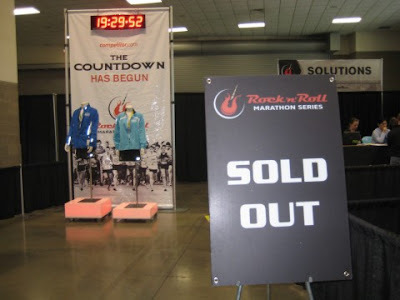 That is how long it took for them to get through all the different corral starts! But, there were great people to talk to and great music to listen to while waiting to start, and it definitely made the rest of the race better. I didn’t feel like I was weaving in and out of people and I didn’t feel like I was running in a huge crowd of people. That was what was nice about the corral starts. The scenery was beautiful! The spectators were amazing and encouraging! The bands every mile were great! Since the race started in Tukwila and finished in Seattle, we ran in little neighborhoods, ran by a lake, ran in non-populated areas, ran on major highways, and then finished in the city. It was all different areas throughout the 13.1 miles. 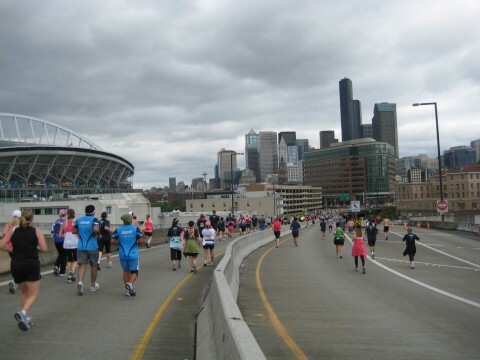 The neatest thing was getting closer to the city and seeing the skyline getting closer and closer until you were there at the finish! 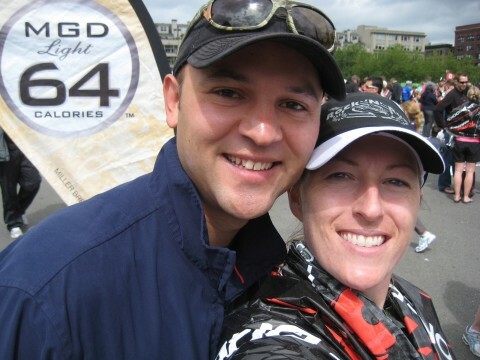 The best thing about the whole race is that I got to see my husband on the course! He was about a mile from the finish line and seeing him so close to the end gave me the strength to finish strong! It was the first race of mine he’s been to and I loved seeing him supporting me on the course! I didn’t feel like I was completely prepared for this half marathon like I was the one in April. 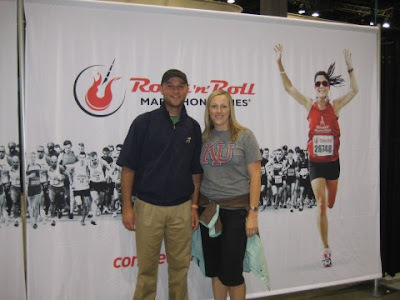 There had been so much going on and I did have some injuries that made me skip training runs, or cut my distances back. I felt pretty good while running the race. I had some soreness in my knee while running, but nothing major. It was about an hour after the race when I noticed my foot was really hurting. It hurt to walk on it even and it made the last 2 days of our trip a little difficult if I had to be on it for long amounts of time. 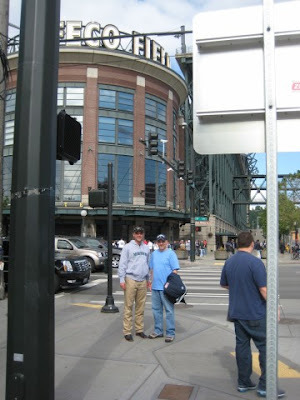 Once I got back from Seattle, I went to the dr after a few days of it not feeling better. They didn’t find anything wrong with it but wanted me to wait a couple weeks and come back if it was still hurting. I stayed off of it (very hard for me to do) for 2 solid weeks and at that time it was feeling much better. Then the pain was completely gone after another few days. I never went back to the dr and have no idea what was wrong with it. It hasn’t acted up since. I usually run in Saucony’s, but I trained for this race and ran this race in Mizuno’s. I didn’t like them as well as my Saucony’s, but gave them a shot. It might or might not be the shoes, but that race was the last time I wore them and I went back to the kind I know that have worked for me in the past! Even with not being as prepared as I would have liked, I still did the 13.1 miles in 2 hours, 27 minutes and 54 seconds, so I was pleased. My pace was 11:14. 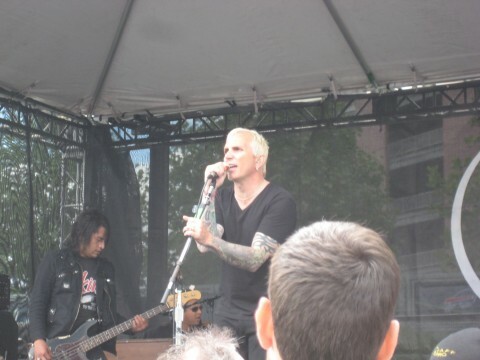 Everclear (one of my favorite bands from my college days) performed at the post race party and it was awesome to see them in person and hear some of their great songs! We hung around the party for an hour or so, then headed back to the hotel to rest a while before going to meet up with my brother-in-law and his wife. I did love my first experience with a Rock-n-Roll series race and can’t wait to do the Las Vegas one in December! I wrote this blog post a month or so ago, but I'm just now getting around to posting it. Since writing this, I have actually finished my 2nd RNR event, but that race report will come a little later. Below are some pictures from the race and the overall trip! I also wanted to add the website for the Rock 'n Roll Series events. If you haven't checked it out, you should! They have so many different sites all over the country! 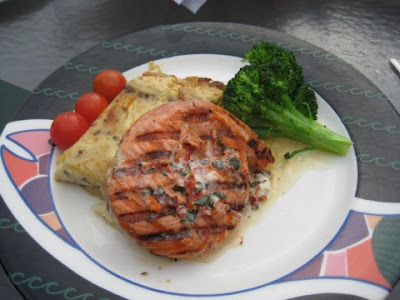 The best salmon I have ever had!!! YUMMY! All the fresh seafood at Pike Place Market! 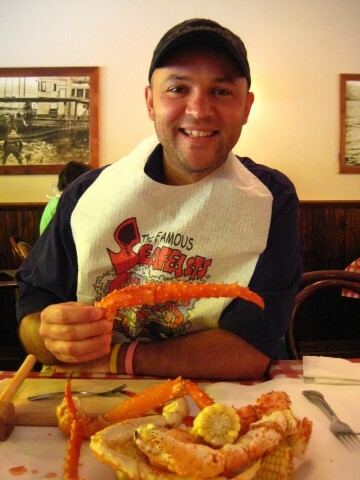 David eating his crab legs! 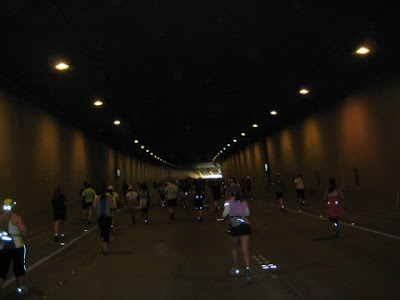 Runners in their reflective gear in the tunnel! Last picture of us before we had to get on a plane later that day. We had a great time in Seattle! 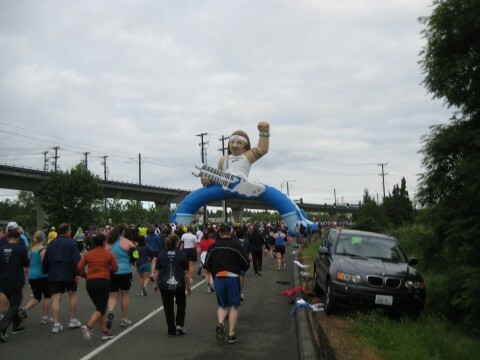 On June 11, 2011 I ran in "The World's Only 6,147,777 mm Race." I'll get to what that means in a little bit. My hometown of Fredonia, KS has the annual Fredonia Flag Festival. Why does my hometown have a flag festival? 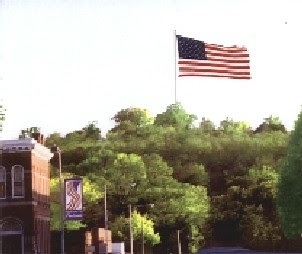 Well, Fredonia has a 40 x 60 foot American Flag that flies on a 100 foot flagpole atop the South Mound. You can see the flag from miles away and it really is a gorgeous site! Sorry that the picture above is a little blurry, but you get the idea. Every year the Flag Festival raises money to maintain the flag (you wouldn't think a flag would cost a lot of money, but it's a big flag)! For the last 3 years, they have incorporated a race into the festival. I have ran this race the last 2 years. Now to the explanation of the 6,147,777 mm race. Why not a 5K? Well, to be creative, they decided to signify the date that congress adopted the American flag which was 6/14/1777, hence the 6,147,777 mm race and why the flag festival is held around that same time every year. The race comes out to be about a 6K and 3.82 miles is what my Garmin clocked it at this year. It was a nice, warm June morning and I ran with my friend, Sarah. Running with friends always makes races more enjoyable! Our time was 42:23 and the pace was 11:05 min/mile. There were 2 water stops along the route, which was really nice since it was pretty warm that day. They also had water and fruit at the finish line - bananas are my favorite after a race! It's a small race (about 20 people maybe), but the town is small too. I think every year they will continue to get more participants and it will keep growing! I was only a few weeks out from my Rock-n-Roll Seattle Half Marathon, so my training plan had me running 10 that day, so I actually got up extra early and ran 6.32 miles before the race. 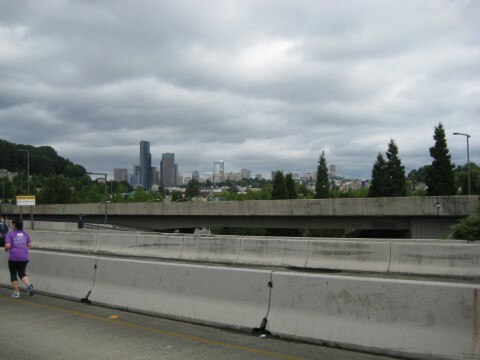 Then with the 3.82 for the race, I got my 10 miles in for my Seattle training! Win-win situation! This is definitely the smallest race I participate in, but I'm there to support my hometown and it's great to be able to run with my friends who I don't get to see all the time! I can't wait until next year's race! I'm a little late on some race reports, so I'm catching up. 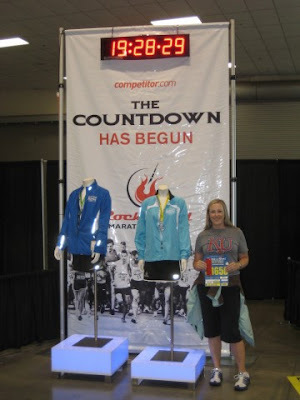 This race was on June 4th and it took place in Kansas City, MO starting and ending at Crown Center. 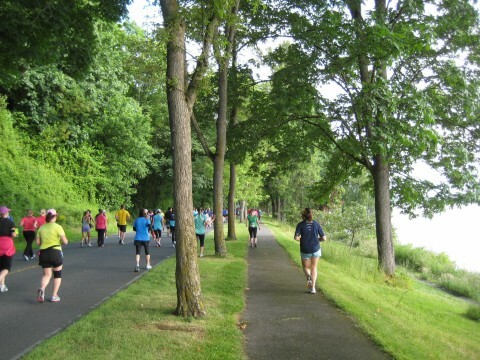 This is a race that draws many participants and is always a favorite among runners in the area! I always get really excited about this race until I'm about a mile into it running up the first of many hills, and then I start wondering why in the world I signed up for it! It's not called Hospital Hill for nothing. There is a huge hill that goes right by the hospital and then quite a few other hills throughout the race. If you're looking for flat, this is not the race for you. 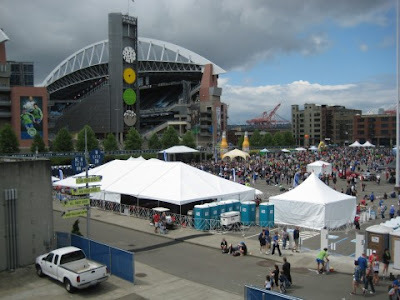 Below is a picture of the Finish Line when I first got there. Not too many people yet, but then the next picture shows the crowd of people at the start line! The great thing about this race is it is so well organized! They have great perks for the runners, great medals, great water stations, tons of support along the course and that is why people continue to do this race year after year. This was my second time doing the race and I did the 10K both times. They also have a 5K and a Half Marathon. I honestly don't think I could ever do the Half Marathon on this course because not only is the course hard, but it's usually pretty hot in Kansas in June. It's pretty brutal, but that is also what makes finishing that much sweeter! Below is a picture shortly after the start. We are heading toward downtown KC and you can see all the people way up there! This next picture is in the last mile and there is actually a nice downhill heading toward the finish line. This was a nice sight after looking up so many hills throughout the race! My 10K time was 1 hour, 8 minutes and 29 seconds with a pace of 10:51. Not a PR for me, but I wouldn't expect a PR on this course (for me at least). 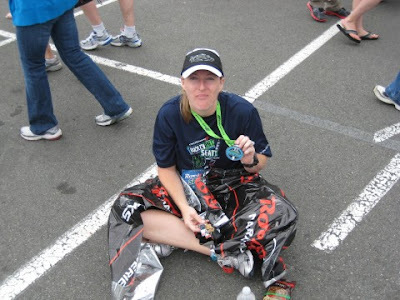 Here I am with my medal post race! I was ready to get in my car and turn the A/C on! This race is still one of my favorites, regardless of the hills and the heat! And I will be doing it again in 2012! I can't say that I'm back, because I was never really gone. I was just a little absent from the blogging world. I have quite a few race reports to write and I hope that making this post tonight will keep me accountable to actually write those reports in the next few weeks. But for now, I'll leave you with these pictures of all my running shoes from old to new (minus the pair I ran in while training for my first half marathon back in 2008). I have ran through many pairs of shoes, but I can't bring myself to getting rid of my old running shoes. I still wear them when I walk the dogs or when I'm going to the store. And by looking at them, you can probably tell I'm a Saucony girl! 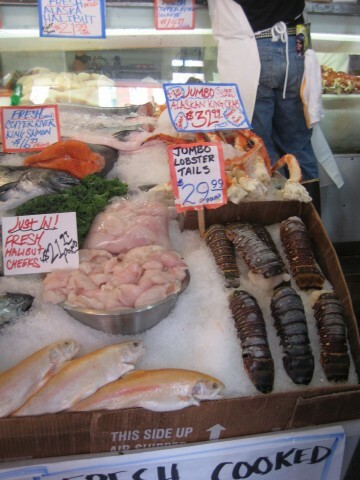 The oldest pair is in the lower right hand corner and they are Saucony Paramounts. You can see that I have 2 pairs of Paramounts - exact same shoe, different color. And I also have a pair of Paramount 2's. It's just hard to switch to a new style when you find one that works. But I eventually had to because they don't make the Paramounts anymore. The Mizuno's took me through a half marathon, but I always go back to Saucony's! I have the Kinvara's, but they are only used on shorter runs. They are a little too minimal for me and I need a little more support. My newest and favorite pair (top left hand corner) are the Saucony Cortana's! They are so comfortable and they have tons of fun colors - it was hard to choose which color combo to get! The way to tell how old my shoes are is if you can see the label in the sock of the shoe. You can't see it in the older ones on the bottom row, but you can see the label in all the newer ones on the top row! Looks like the top row need to get some more miles on them! Anyway, enjoy my running shoes and hopefully it won't be another 4 months until I blog again!!! I need to get caught up! I have 2 race reports to write and will have another one after this Saturday! 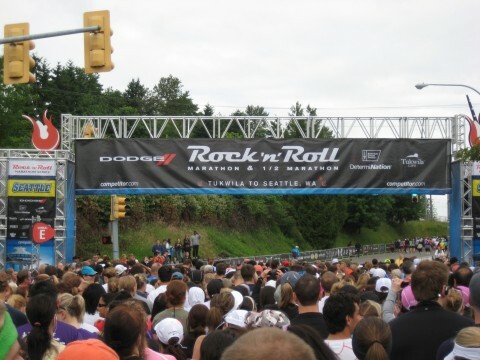 June 4th, I did the Hospital Hill 10K in Kansas City, June 11th, I did the Fredonia Flag Festival 6K, and this Saturday I will do the Rock-n-Roll Seattle Half Marathon! I promise that I will get caught up after our vacation this weekend. 1 - We wanted to go somewhere for our anniversary. 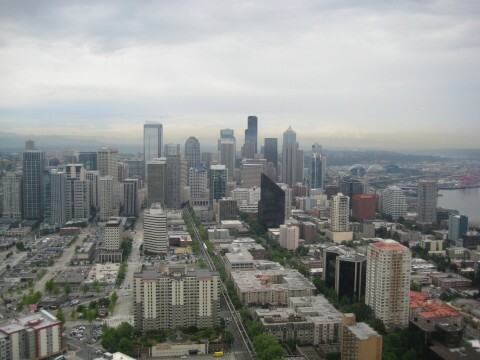 Our 1 year anniversary isn't until August 28th, but we decided to do the trip a little early and we decided on Seattle! 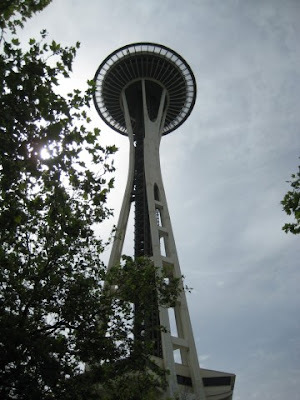 I have been to Seattle once for work (8 years ago this month) and it was only for 1 day. I've always wanted to go back. 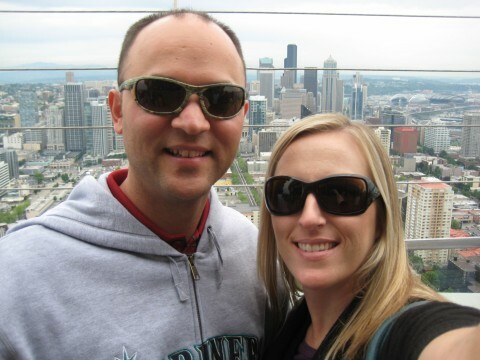 2 - David's brother lives about an hour away from Seattle and I haven't gotten to meet him and his wife yet, and David hasn't seen him in about 10 years. 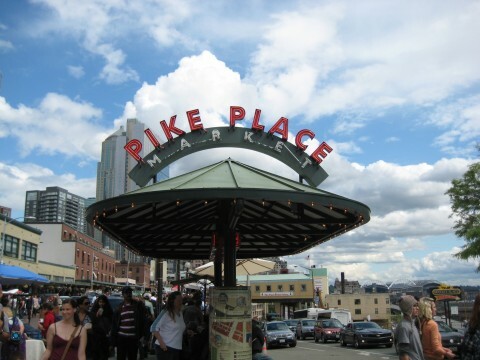 So we are really excited for them to come to Seattle on Saturday and hang out with us! 3 - We decided on this weekend because it is the weekend of the Rock-n-Roll Seattle Marathon series. I was looking for races to do on vacation and I've always wanted to do an RNR race, so the timing was perfect! We will be there 4 nights and hopefully will come back refreshed and full of the fresh seafood Seattle has to offer!!! Once I get back, I'll give a vacation recap and also get caught up on all the race reports I need to write! Have a great weekend everyone! Headbands and a Great Cause! As some of you may know, I trained for my first half marathon through Team in Training. They are an amazing organization that raises money for The Leukemia & Lymphoma Society while helping people train for endurance events. 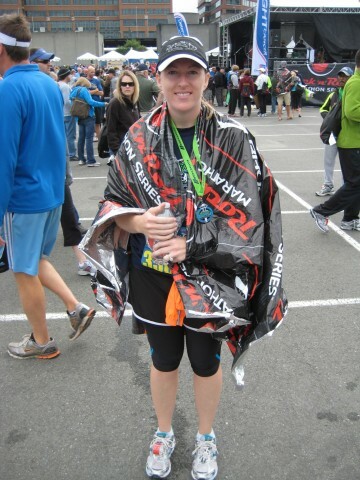 I raised $3900 in 2008 while training for the Nike Womens Half Marathon in San Francisco. I had a friend in high school who lost his battle with leukemia and I ran in memory of him and the many others who have been affected by those diseases. I was catching up on some blogs and came across a post about someone raising money through Team in Training. 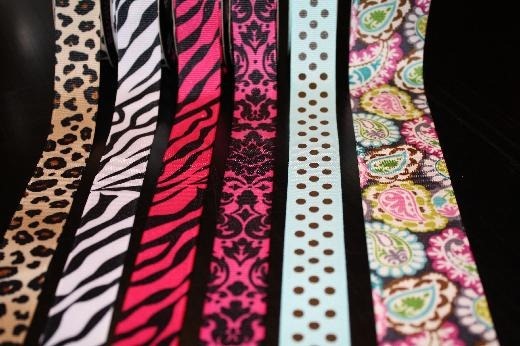 Bethanye has to raise $2500 and has started making her own no-slip headbands to reach her fundraising goal. Go check out her fundraising page HERE, and help her raise money for Team in Training! 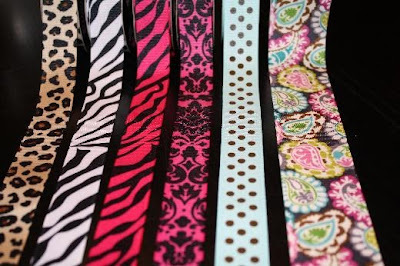 I ordered 3 headbands and absolutely LOVE them!!! I'm a newlywed and a momma of 2 doggy kids! And I love to run! BIG CHANGES for this working momma!